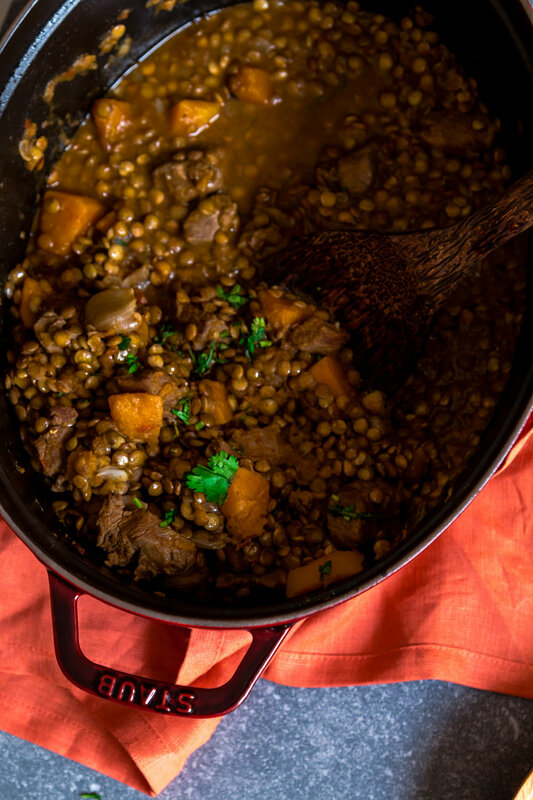 This stew is basically this recipe customized with lamb and pumpkin and oh yes, I also used shallots instead of onions. I had tons of shallots at home that I didn’t use for recipe testing and they made such a difference! 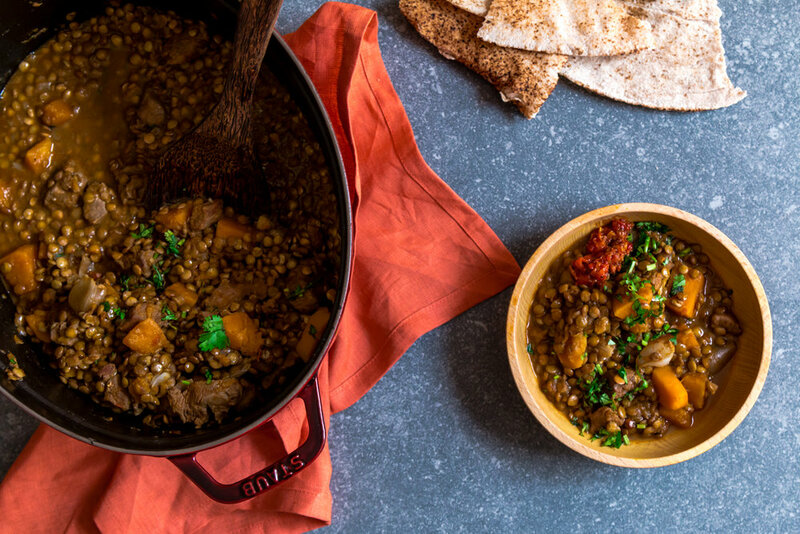 They add sweetness, flavour and chunkiness to this already-super-tasty stew. 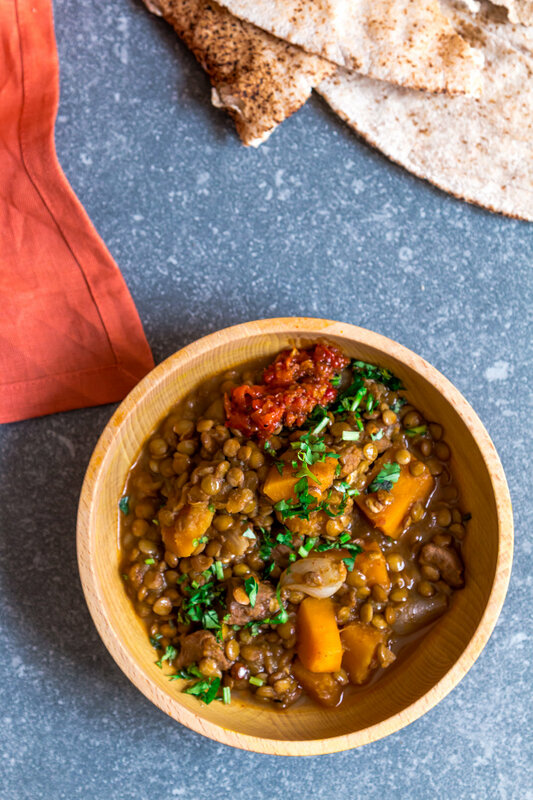 I always enjoy my Moroccan lentils with plenty of harissa and make sure to make a big mess in my plate by dipping the bread in the harissa and the stew, then the harissa and the stew again. It’s so so good, I think I will make it again tomorrow. So if you like harissa (and not necessarily eating like a 5 years old) don't forget to serve it with your favourite red sauce! Before I go, do you remember this aubergine and pumpkin tagine with caramelised onions and these pumpkin spice cupcakes with orange blossom cream cheese frosting? Which one is your favourite? What should we make next year with pumpkin? An orange blossom pumpkin pie with speculoos crust? Or maybe we should just make it this year? 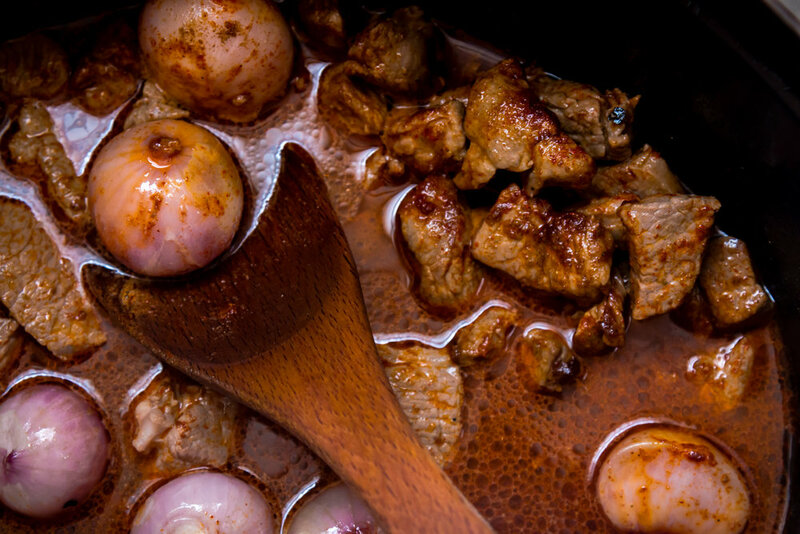 • In a large saucepan, warm the olive oil over medium heat and add the lamb. Cook the meat, stirring occasionally for 5 to 10 minutes to lightly brown the meat. • Add in the tomatoes, paprika, cumin, salt, cayenne pepper and stir in the stock. Bring to a boil over high heat and reduce the heat to medium-low. Cover with a lid and leave until the meat is half cooked, about 1 hour. By half cooked I mean when the chunks of meat are starting to soften but are not fork tender yet. • Add in the lentils and the shallots and pour in enough water to cover the lentils (about 200 to 250ml). Bring to a boil over high heat then reduce the heat to medium-low. Cover with a lid and leave until the lentils are cooked and soft, about 40 minutes. 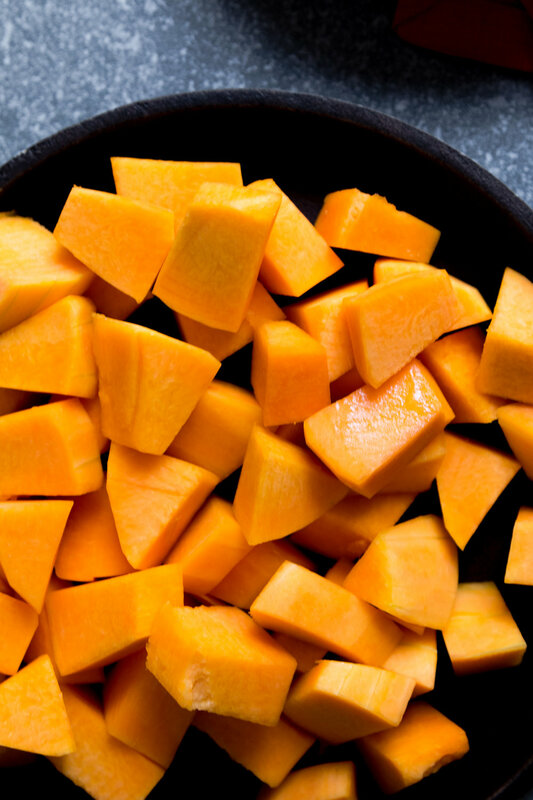 • Add in the pumpkin chunks in the saucepan and mix them with the rest of the ingredients, cover with a lid and leave until the pumpkin, shallots and chunks of meat are all cooked and soft. • Serve with bread, chopped coriander and harissa, if desired. 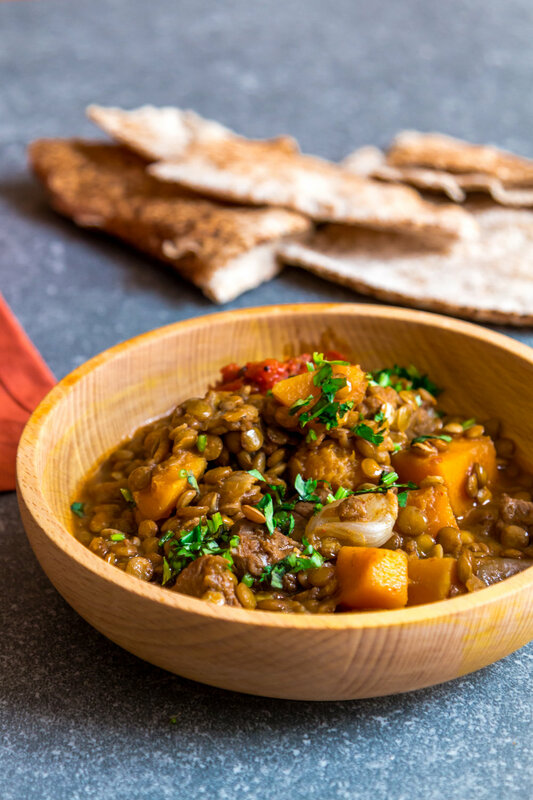 • Depending on your lentils you will be using, you might have to add some water if all the liquids evaporate before the lentils are cooked. Keep an eye on the lentils while they are cooking and add more water if necessary.